In the space of just four years, Stanton has gone from an unemployed bond trader to Internet sensation. His Facebook page—featuring his iconic photos and stories of everyday people—has more than 10 million likes, and his 2013 book, Humans of New York, spent 21 weeks on The New York Times Best-Seller List. A follow-up book, Little Humans, is due out next week. But it didn’t happen all at once, he told the audience last night. 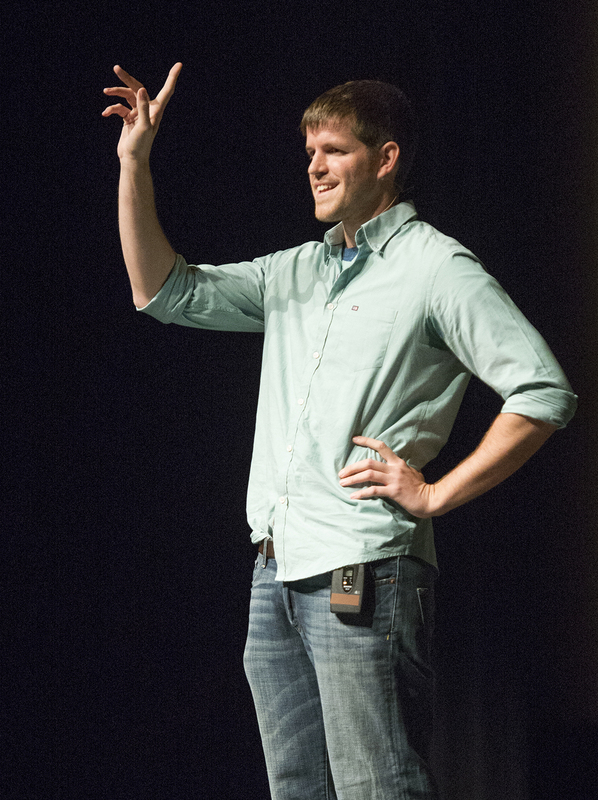 Instead, he found his niche through an evolution, a gradual series of tweaks to his approach. In 2010, as a 26-year-old bond trader in Chicago, Stanton “was looking for a hobby,” and after winning $4,000 in a football pool, he bought his first camera. Originally he photographed landscapes and landmarks in Chicago. When he eventually started taking photos of people, it was from far away, without their knowing. Then, for a while, he would find someone who was engrossed in something—say, reading a newspaper—and position himself on one knee, waiting for them to look up and realize he was there. When they did, he’d snap their photo—which, needless to say, they didn’t always appreciate. “I didn’t know you could ask people to take their photo,” he says simply. About five weeks into his new hobby, Stanton got fired from his job, and got the idea to move to New York City to pursue his street photography. Given New York’s rich diversity of people, he says, “I just thought, This would be such a great place to do a [photo] blog. “I was sleeping on a mattress in the cheapest room I could possibly find in Bedford-Stuyvesant, taking 20 to 30 portraits a day,” he recalls. “And that went on for six months, in complete anonymity. It was a very hard and lonely time. The photo—one that Stanton had initially regarded as a “throwaway”—became an instant hit. (Currently it has nearly 156,000 “likes.”) Stanton changed his approach accordingly, and now spends as much time talking with each of his subjects as he does shooting their photos; brief excerpts from those conversations now accompany the portraits he posts to his Facebook page. The questions he asks are personal—”What is your greatest struggle right now?” “Can you remember the time when you felt the most afraid?”—and the answers he gets are surprisingly honest. In August and September of this year, Stanton took his HONY concept to an international level, doing a 50-day world tour in partnership with the United Nations. His photos of schoolchildren, shopkeepers, and young mothers in such countries as Iraq, Israel, and Ukraine revealed that even in areas ravaged by conflict, people are … well, people. There’s a reason for that, he told his audience last night: He went out of his way to look for ordinary people and moments. “If I’m covering a rally or protest with 12 journalists, and they all have cameras … there could be one guy who’s really angry and all 12 photographers will be gathered around that person. And that’s the photo that goes out to the world. People want to find the extreme images and stories; those are what really sell newspapers. “I wanted to depict normality in places where very extreme headlines are coming out … to apply this normal intimate process in some scary places. 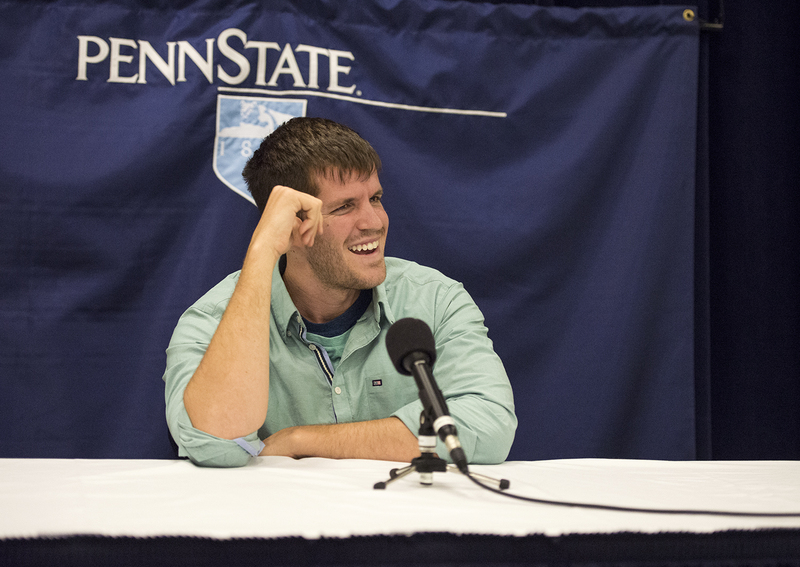 Stanton’s lecture last night was sponsored by the Penn State Student Programming Association. Entry filed under: Students, University Park. Tags: Brandon Stanton, Humans of New York, street photography. Thank you, thank you, thank you. I had never heard of this man, his work or his FB page. Love it.